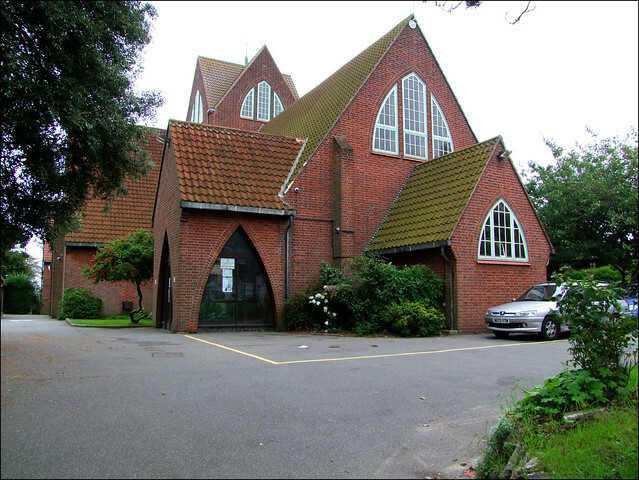 Gorleston may seem an unlikely place to find one of the great church architectural treasures of the Twentieth Century. But here, just up the High Street from the shops and set slightly back from the road, is the only church designed by Eric Gill. Twentieth Century English art seems to have had more than its fair share of eccentrics, but can any of its artists have been more eccentric, and even controversial, than Eric Gill? Gill was born in Brighton in 1882, and quickly established himself as a genius of sorts. He was heavily influenced by the English Arts and Crafts movement, and trained as an architect with that major figure of the pre-WWI era, WD Caroe. However, Gill became disillusioned, and taking evening classes in calligraphy and stone masonry he left architecture to seek a career as a monumental mason. He designed several typefaces which are among those still in common usage today, and established a religious community for fellow-artists. His most famous works are probably the monumental sculptures found on the front of several large London buildings of the 1930s. In later life, Gill lived at High Wycombe in Buckinghamshire, and from High Wycombe to Gorleston there came in 1928 a new Catholic Priest, Thomas Walker. Shortly after his arrival, the Catholic community in Gorleston was left a large legacy with which to build itself a proper church. Walker, a friend of the Gill family and an admirer of Eric Gill's work, asked him to design a church for the parish. Work began on the church in 1938, and was completed before the outbreak of the Second World War. Just about everything here is Gill's, although some of it was completed on his behalf, because he was already very ill and died of cancer in 1940. The quiet red brick of the church exterior hides an interior of quiet yet breath-taking beauty. Gill created a cruciform church around a central altar, a fairly revolutionary idea in the 1930s but one which would become commonplace after the reforms of the Second Vatican Council in the 1960s. The tower above the altar is supported on pointed crossing arches springing from the floor, and these arches are repeated throughout the building. It is said that Gill had some doubt that the arches would succeed in supporting the tower, and it was not until the workmen removed the supports that it was realised that they would. Gill made the altar and font in his High Wycombe workshop, and it is his lettering around the base of the altar. Some of the decorative details within the church, like the fresco in the tower, were completed by his son-in-law Denis Tegetmeier to Gill's designs. The major feature which is not the work of Gill is the east window, depicting the Risen Christ flanked by his Blessed Mother and St Peter. These were installed in 1963 to the design of another High Wycombe artist, Joseph Nuttgens, who had been Gill's friend. Nuttgens' claimed that he had helped Gill to design the church, but had never been given credit for this. As Gill had insisted on plain glass throughout, Nuttgens called the east window his 'revenge on Gill', but it is very fine, not overstated and not intrusive. It is hard to think that the church would be improved without it. There is another stained glass window in the south chancel Walsingham chapel, installed in 1994. It is not as good, but perfect in its setting and in any case not visible from most of the church. The excellent church guide quotes FionaMacCarthy's biography of Gill: he seized on the project as a long-awaited opportunity to put into practice a multitude of related ideas about building, preaching, singing, church history, world politics, all burgeoning out from the elementary question: What is a church? Gill chose brick for the project rather than the contemporarily popular concrete because he was concerned about the way local crafts were being superceded by what he called 'mechanical town methods'. He insisted that local workmen and artisans were used on the project, who must have thought him a rather wild figure with his flowing hair and monk's robes. The church was opened on the 14th June 1939 by the Bishop of Northampton, and it was consecrated in 1963. It underwent a fairly major restoration in the 1990s, when changes which had been made to the integrity in the years since were restored to Gill's vision. There is a high drama to the crossing, and the way the arches intersect. As you walk from west to east, towering vistas open and close. And there is a drama to Eric Gill, of course. Fiona Macarthey's 1989 biography revealed something of Gill's idiosyncratic, not to say scandalous, personal life, and there were even discussions about whether Westminster Cathedral, which has stations of the cross by Gill, should remove them. Fortunately, good sense prevailed. And this fine building, put up in the very last years of the artist's life, became a grade II* listed building in 1994. Unfortunately, it never appears to be open outside of Mass times, which is not just a pity but wrong, for a Catholic church should always be accessible to the Faithful. However, I found the mild-mannered and pleasant parish priest very happy to let me see inside when I called - and, as he said to me afterwards, it is a wonderful building indeed.